I enjoy IPAs, I really do. 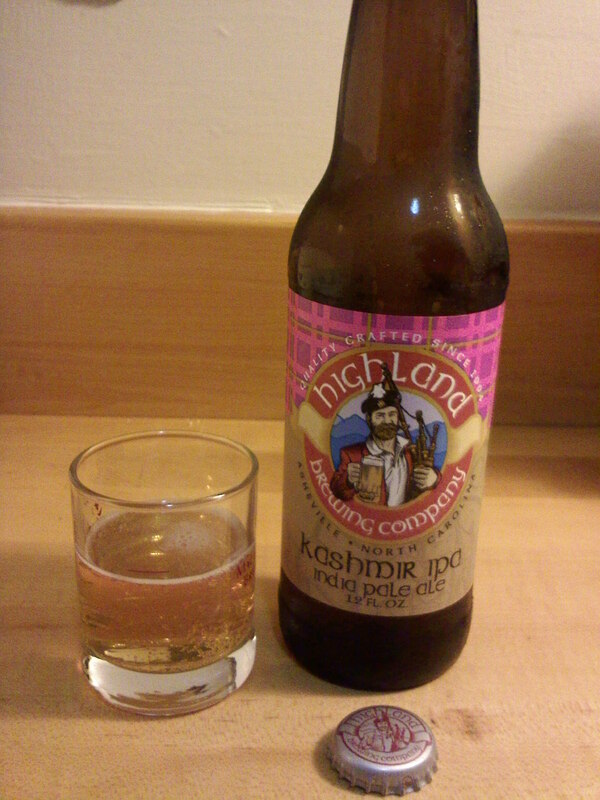 But I enjoyed Highland Brewing Company's Kashmir IPA only so-so. I had high expectations (there is a Scotsman with bagpipes on the label for cripes sake!) but was pretty underwhelmed. It was like waiting almost 4 years to see Machete after first seeing it as a fake trailer during the Rodriguez/Tarantino flick Grindhouse, then finally seeing it and saying "OK, that was pretty good, but not all that I had hoped for." I wasn't waiting 4 years to drink this beer or anything, it was only in my fridge for 6 days, but I was hoping for a bit more upon cracking it open on a cool Saturday evening. If there was a project that froze beer samples and stored them in a side of a mountain for future generations (i.e. Aliens and/or Predators) to later understand the variety of beers circa 2011, you could file the Kashmir IPA under "average India Pale Ale." That's right, this was just an average IPA, not too hoppy, not hoppy enough, not too bitter, not bitter enough, not too long lasting taste, not long lasting taste enough. It's the Goldilocks of IPAs. But that doesn't mean it was "just right" and I would buy it again because it fit my taste buds and needs. It didn't WOW me like I thought it would, and therefore I probably wouldn't get it again. It has an ABV of 5.6%, and runs for about $10 a six-pack. Highland Brewing Company has five other beers to choose from, so I would like to see if those fall into the "average" category as well, or if they can be like Snakes on a Plane and completely exceed all expectations possible. One great thing about this beer though - it is brewed in Asheville, NC, an awesome (so-I-hear) town in the mountains of western NC. Asheville is also home to the phenomenal band Now You See Them, which can you hear playing through the lovely music player on this hear fine blog. If you ever get a chance to see them live, definitely do! You will be rewarded with great music, fun times, cans of PBR and jalepeno poppers at Sheetz at 3am (The PBR wasn't consumed at Sheetz, it was drank beforehand at the bar. But now that I think about it, PBR and Poppers at Sheetz, egad!!!). That was a heck of a night! Nice pink bottle. Hope it matches your popped collar. Excellent commentary from your wife. I was so happy to see Highland beer mentioned on this blog. As a resident of Asheville, NC, I am very proud of Highland Brewery and its beer. It's understandable that one could find the Kashmir IPA underwhelming, but I highly recommend the St. Therese's pale ale. It's definitely on the top of my list as far as local beers go. I'm also a big fan of Now You See Them, as I am in it. :) Thanks for the shout-out! This is a great blog.